"Thank you," to the trustees of the Josephson fund for your help with expenses related to our recent trip to the RAAN in Nicaragua. I led a group of attendings, residents and a medical student from the Lawrence Family Medicine Residency to the NE corner of Nicaragua. 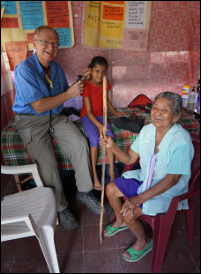 This the thirteenth annual trip for us, and this year, as usual, we stayed with a Nicaraguan family on a farm and, daily, walked a little over 3 KM to and from the health post in Mongallo, where we saw over 500 patients. This year the group discovered 2 new diabetics, a pre-eclamptic woman (mother and child were fine after induced delivery), multiple hypertensives, provided antihelminthic treatment for over 300 persons, and screened over one hundred children for anemia, treating thirty with iron sulfate brought in from the US. An exciting part of the trip is "field clinic," an opportunity to pack everything, including the health post nurse, into a four-wheel drive and travel "up the mountain" to a remote village, Cano Seco, where we provide screening and care for people who have a huge roadblock to care - "access." The trip to the health post is too long to walk or ride, and too costly to take the bus - "la routa." Thus, the citizens don't see a doctor unless one travels to their remote village. Seeing old friends, taking care of new and old patients, watching children grow up, staying with a generous and hospitable family, consulting with the clinic nurse on cases, leaving equipment and medications for her use and being back in the beautiful, yet impoverished RAAN of Nicaragua was a life-changing experience for all 7 of us. We'll be back next year!